Apart from the updated and visible TinyMCE integration, this release features a lot of improvements under the hood. I did an intense code review especially of the code for the backend and tried to improve it where possible. I managed to reduce the number of mysql queries and http requests needed as a result, making the plugin much more efficient regarding load time and responsiveness. 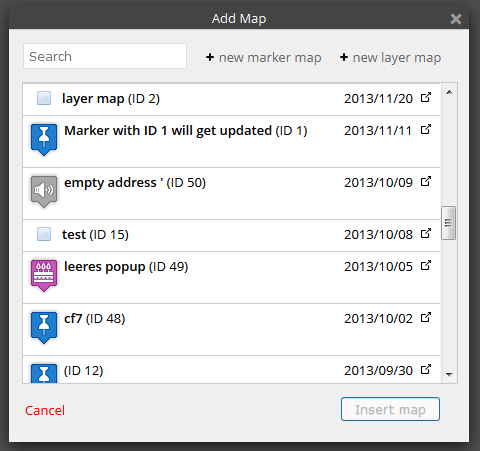 Marker icons and layer icon are now shown left to the title of the maps. I also added a link on the left of each entry to open the map in a new window. The insert button can now only be clicked if a map is selected. The text “powered by mapsmarker.com” got removed. I also changed the way the Maps Marker TinyMCE popup plugin is loaded, making the loading more efficient. Styles are also tested against WordPress 3.9-alpha which will include the updated TinyMCE 4.0 as a major highlight. If you want to hide the TinyMCE button, please navigate to Settings / Misc / General Settings and change the setting “TinyMCE button” to “disabled”. The translation site at http://translate.mapsmarker.com/projects/lmm got a new design and soon also support login via SSL. If you want to contribute to translations (some would need updates), please visit http://translate.mapsmarker.com/projects/lmm for more information. Please note that translators are also compensated for their contribution – for example if a translation is finished less than 50%, the translator gets a free 25 licenses pack worth €199 as a compensation for completing the translation to 100%.